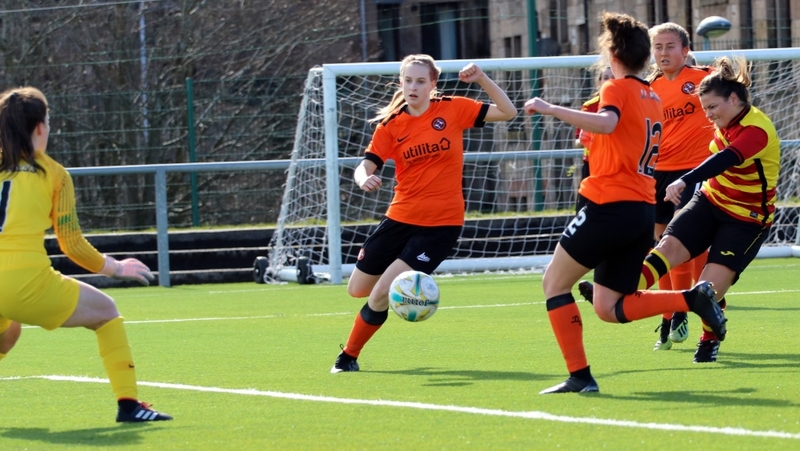 Partick Thistle picked up their first three points since promotion to Scottish Building Society SWPL 2 with a 2-1 win over fellow newbies Dundee United at Petershill Park. This was the Jags first game in two weeks, following the postponement of their clash with Hutchison Vale, but they weren’t lacking sharpness and almost took an early lead. A long ball found its way through to Emma Lawton but she was unable to find the target with her volleyed effort. It wasn’t long until United created their first chance with Neve Guthrie firing goalwards, but her shot was well blocked by Thistle keeper Nicolle Andrews. Thistle would take the lead on 11 minutes though when Lawton’s scuffed effort on goal was deflected into her own net by Georgia Carter. Suzanne MacTaggart really should have made it two just six minutes later when Lawton’s shot deflected to the forward, but she somehow managed to smack the ball off the crossbar and out for a goal kick. However, it was 2-0 just before the half hour mark when Cheryl Rigden played a one-two with Sara Paterson before keeping her cool to send the ball beyond Aaliyah-Jay Meach into the net. Leeanne Hughes went close at the start of the second half when she was denied by Meach, with the United keeper then on hand to deny MacTaggart as Thistle pressed for a third. The visitors made for a nervy ending though when the ball was played through to substitute Katie Caine and she slotted it under Andrews into the net. Thistle were looking a bit leggy as United went in search of an unlikely equaliser and they almost got it in stoppage time when Caine fired a shot across the face of goal. United couldn’t force the ball into the net though as they fell to their first defeat of the season while Thistle move level on points with the Tangerines. Neither side is in action next week after both were knocked out of the SWPL League Cup but when they return to action on the 31st, Thistle travel to Perth to take on St Johnstone while United welcome Hamilton Accies to the GA Arena.